When Ross Poldark returned home to Cornwall in 1783 as a survivor of the American War of Independence, the last thing he could’ve expected was the turmoil that awaited him. If learning about the death of his father wasn’t tough enough, Ross discovered that his extended family presumed he too had died. Then, there’s the matter of Ross’ dwindling resources. As these revelations come about, Ross is dealt another serious blow. Elizabeth Chenowyth, Ross’ pre-war love interest, had moved on to his cousin Francis – the two would soon be wed. Despite Elizabeth’s decision to move ahead with marrying Francis, the romantic tension between Ross and she is palpable. With that in mind, we have to ask: did Elizabeth make the right decision to stick with Francis? Or, should she have abandoned her marriage plans and rekindled her intimate relationship with Ross? You can tell us what you think below. 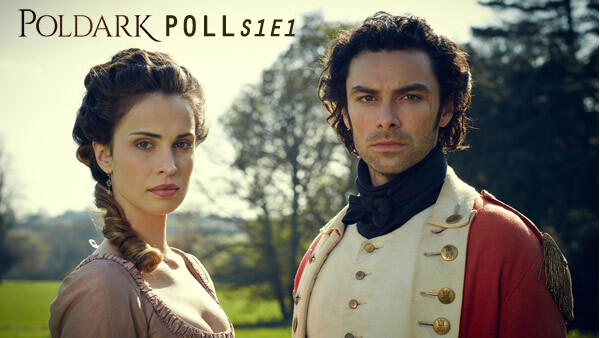 VisionTV’s encore presentation of Season 1 of “Poldark” can be seen on Wednesday nights at 10pm ET/7pm PT, following Doc Martin. Also, please be sure to enter our A Year of Poldark Contest for your chance to win a show calendar, as well as an autographed photo of Ross Poldark himself, Aidan Turner! This entry was posted in Articles and tagged Aidan Turner, British, Drama, elizabeth, heida reed, Poldark, poll, quiz. Bookmark the permalink.